APOPO addresses global issues through research, development and deployment of scent detection technology at its training and research center in Tanzania and seven other countries. 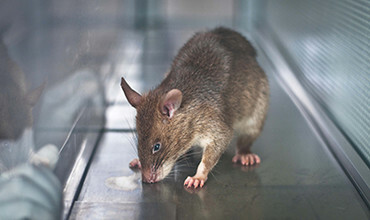 The highly developed sense of smell and light weight of our African giant pouched rats, nicknamed ‘HeroRATs’, make them ideal detectors of landmines and tuberculosis. Over 60 countries and states suffer from the blight of hidden landmines. APOPO's landmines detection rats ignore scrap metal and only detect explosive scent, making them much faster at finding landmines than metal detectors. HeroRATs sniff out the chemical compounds of TNT (explosive) found in landmines and other explosive remnants of war. They ignore scrap metal making them much faster at detecting landmines than metal detectors. Detecting tuberculosis remains one of the biggest challenges facing medical professionals. APOPO’s TB detection rats can check 100 samples for tuberculosis in 20 minutes; the same task would take a lab technician up to 4 days. Suspect samples are re-checked using LED fluorescence microscopy. The APOPO tuberculosis detection rats check TB samples collected from local clinics. Any they indicate as suspect are reconfirmed by WHO endorsed methods. Our research program indicates that the rats can increase detection rate of partner clinics by 40%. It is our mission to develop detection rats technology to provide solutions for global problems and inspire positive social change. Quality - Demonstrating and promoting high standards in research, design, training and implementation of detection rats technology. Innovation - Pioneering creative research and innovative solutions within a participatory learning culture. Social transformation - Developing skills, creating jobs, improving socio-economic and environmental conditions, releasing land for development, and combating public health issues. Diversity - Embracing diversity in all facets of the organization with respect to age, gender, religion, sexual orientation, physical abilities, nationality or ethnicity.